The purpose of myBookTunes is to transform audio books originally distributed on audio CD into a simple, high quality, audio book for the iPod. The two most important attributes of these books are: 1. Audio quality superior to that found with most "downloaded" audio books. 2. The playback convenience of a downloaded book, in particular an automatic bookmark that returns the listener to his/her place. 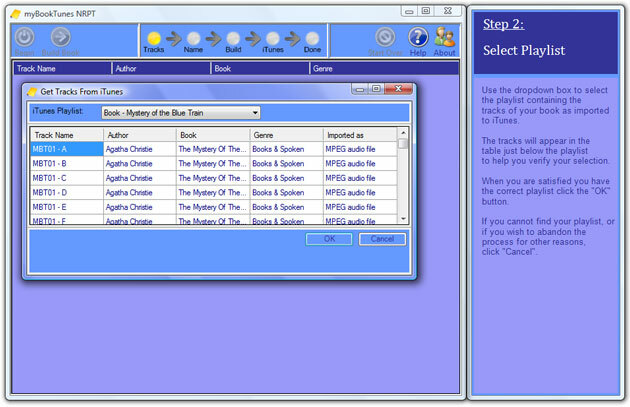 myBookTunes can transform audio books on audio CD into audio book for the ipod. ...... This is reflected in the three-step book building process - import the book into iTunes, run myBookTunes, enjoy the book on your iPod. myBookTunes was made by our family to solve a problem. Perhaps you have this problem too. We love books on CDs. They sound great on our iPods and the CDs are a secure backup should something happen to the computer. But we do not enjoy having to memorize where we leave off just so we can listen to some music now and then. So we built myBookTunes to make iPod audio books that remember your place. * Convert as many books as you wish. * Special discount on the next major release of myBookTunes, and free updates and enhancements until then. Qweas is providing links to myBookTunes 1.0 as a courtesy, and makes no representations regarding myBookTunes or any other applications or any information related thereto. Any questions, complaints or claims regarding this application myBookTunes 1.0 must be directed to the appropriate software vendor. You may click the publisher link of myBookTunes on the top of this page to get more details about the vendor.